eat your heart out - - - 10 messages. Showing 1 through 10. 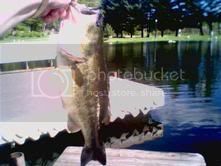 5 pound + bass caught and relest may 15th 2006 on a green buzz bait..
Beauty bass Iceman! Did you give him a kiss? Bass season doesn't open till Saturday, but I catch a few 3 lb bass which is about large for this part of the St. Louis River. Hopefully this year I remember to bring the camera out more. Well I got my 15 hsp tuned & on the boat last night. Rick & I went to round. We had plenty of bugs hatching so instead of deep I went shallow. It did not take long to find the 1st one ,when it was all over we caught 22 eyes in 2 hours. No pike,no bass just good 18" eaters. The only bummer was my camera was in with my crappie gear and I forgot lights to stay past sundown. With the warmer weather on us we should see better action and size. I am going again tonight as we are going to have this high move out .The low moving in will trigger an active feed. I have 8 more pics to take before I can take it to be developed. I'll get it all on disc too so I can post them here. My rule on eyes is no pic unless it is over 24"so everything you'll see will be over 4 lbs. Of coarse they will all be released to be caught again. Time for keith to buy a digital camera Cheaper in the long run, just don't be droppin it in no lakes. I agree,but I am a single guy with a low paying job.I just had my house burn up by my EX and we had no insurance. So I had to come up with 40 grand to rebuild,but it is all mine now & I still live up north so the disposable works. I also need a gps,another FL-8 . It might be slower getting pics posted ,but they will come as I said. I learned a long time ago that proof is in the pudding not what the cook says. I didn't know about the EX thing.... whattttta @#$#$@ I think I might just stay single instead of lookin for a wife someday. From all the pictures etc, you need to get them Jigs up on eBay and make something from them. It sounds like they'd be decent for fly fishing as well even for wet flies. I agree ,but the real issue is how much down time do I need to tie. I'd rather be out ripping lips and use the nasty days for tieing. I do want to sell them ,but to have 1000's on order would take too much time to tie.The ones I've sold through this site and from the guys that already know it seems to be enough business for now. I have 2 other guys that are brothers,who taught me the how too's & they have jigs for sale too. If I need to I can buy some from them & resell. I like to teach the guy how to use it too,So staying small time is better now. I can thank the jig for making me who I am today. Without it I'd be like any othe Joe,but with it I have gained a reputation know as Crappie Keith.